Please join Elizabeth and our other amazing readers on Tuesday, June 6, 2017 in the upstairs bar at Hopleaf. Doors open at 7pm, and the show starts at 7:30. It's free, and 21-and-over. RSVP on Facebook. 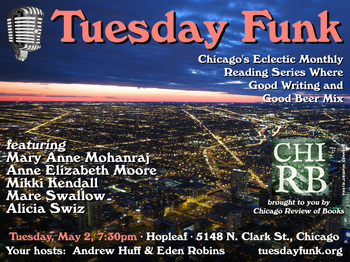 Please join Elizabeth and all our incredible readers for Tuesday Funk #106, Tuesday, June 6, 7:30 p.m. at Hopleaf in Chicago. Admission is free! Nadine Kenney Johnstone is the author of the memoir, Of This Much I'm Sure, about her IVF challenges and the healing power of hope. Her infertility story has appeared in Cosmopolitan, Today's Parent, and Chicago Health Magazine, among others. She teaches at Loyola University and received her MFA from Columbia College in Chicago. 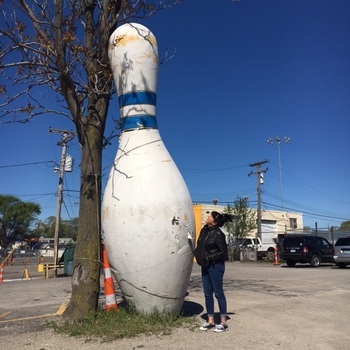 Her other work has been featured in various magazines and anthologies, including Chicago Magazine, The Moth, PANK, and The Magic of Memoir. 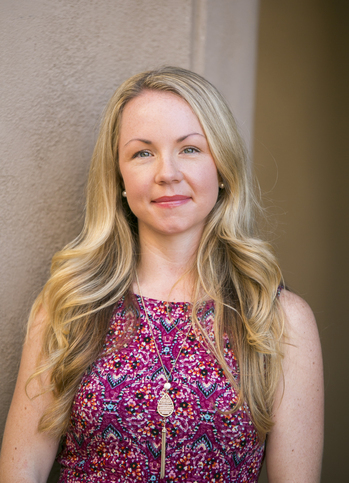 Nadine is a writing coach who presents at conferences internationally. She lives near Chicago with her family. Follow her at nadinekenneyjohnstone.com. 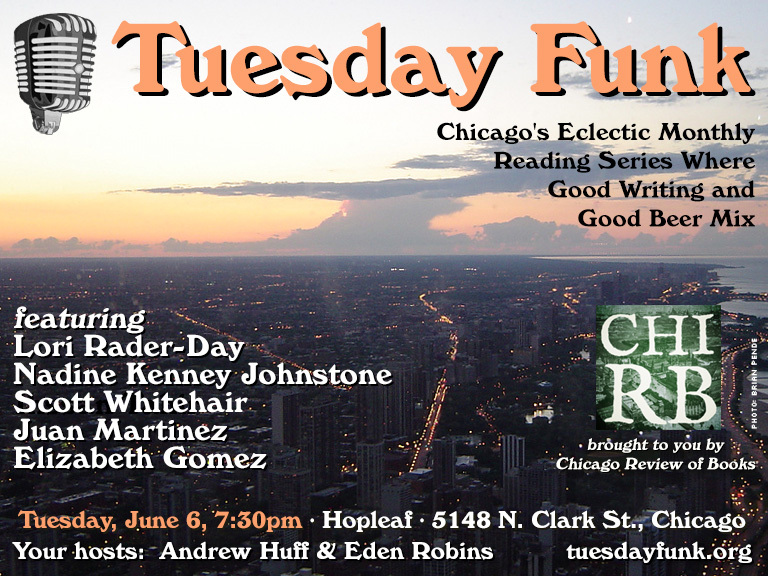 Please join Nadine and our other amazing readers on Tuesday, June 6, 2017 in the upstairs bar at Hopleaf. Doors open at 7pm, and the show starts at 7:30. It's free, and 21-and-over. RSVP on Facebook. 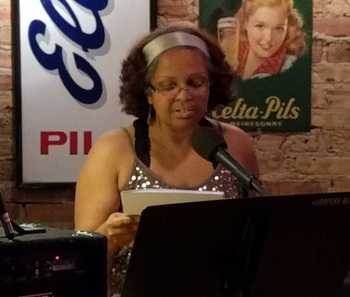 Please join Nadine and all our accomplished readers for Tuesday Funk #106, Tuesday, June 6, 7:30 p.m. at Hopleaf in Chicago. Admission is free! Juan Martinez was born in Bucaramanga, Colombia, and has since lived in Orlando, Florida, and Las Vegas, Nevada. He now lives in Chicago. He's an assistant professor at Northwestern University. 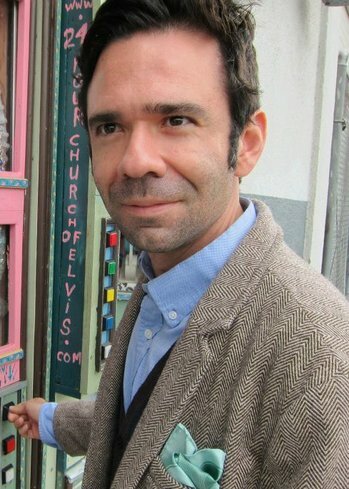 His work and has appeared in various literary journals and anthologies, including Glimmer Train, McSweeney's, The Rumpus, National Public Radio's Selected Shorts, and elsewhere. Small Beer Press released Best Worst American, his story collection, in February 2017. Visit and say hi at fulmerford.com. Please join Juan and our other amazing readers on Tuesday, June 6, 2017 in the upstairs bar at Hopleaf. Doors open at 7pm, and the show starts at 7:30. It's free, and 21-and-over. RSVP on Facebook. Please join Juan and all our outstanding readers for Tuesday Funk #106, Tuesday, June 6, 7:30 p.m. at Hopleaf in Chicago. Admission is free! Only two haiku this month, due to Andrew's busy schedule at the end of April. Tuesday Funk, Chicago's favorite eclectic reading series, returns to the upstairs lounge at Hopleaf in Andersonville for its 106th episode! We know* the weather will be beautiful, so we've lined up Lori Rader-Day, Nadine Kenney Johnstone, Scott Whitehair, Juan Martinez and Elizabeth Gomez to draw you back inside! If that doesn't entice you to join us on Tuesday, June 6, we're not sure you're all that interested in good live lit. As always, doors open at 7 pm (no earlier, but arrive as close to 7 as possible or risk not getting a table) and the show starts at 7:30 pm. Admission is free, but you must be 21 or older. Please RSVP on Facebook -- and while you're there, like our page so you get our announcements right in your stream. Sponsored by the Chicago Review of Books. The weather outside was not very May-like, but Tuesday Funk warmed the upstairs lounge at the Hopleaf with stories both funny and serious -- and sometimes both simultaneously. Mikki Kendall started us off by reading a portion of a new urban fantasy set in an ominous version of Chicago, and invited the audience to suggest a title. Next Shanna Shrum told the story of a very bad day with her beloved dog. Cohost Andrew Huff read a couple of his patented seasonal haiku, then Mare Swallow described a bizarre "show piano" class she took recently, with the assistance of her friend Dan Epstein. After a short break to refill our glasses, cohost Eden Robins read a micro essay, then Mary Anne Mohanraj shared a portion of a new piece of science fiction as well as a romantic poem. Finally, Anne Elizabeth Moore read an excerpt from her new book, Body Horror: Capitalism, Fear, Misogeny, Jokes. We laughed, we cried, we vowed to do it all again on Tuesday, June 6, except with Lori Rader-Day, Nadine Kenney Johnstone, Ihssan Tahir, Juan Martinez and Elizabeth Gomez! See you there! Reminder: Tuesday Funk #105 is tonight! Come celebrate awesomeness at Tuesday Funk tonight, spearheaded by our awesome readers Mikki Kendall, Mary Anne Mohanraj, Anne Elizabeth Moore, Shanna Shrum (filling in for Alicia Swiz, who has had to postpone due to a family emergency) and Mare Swallow! Your humble co-hosts Andrew Huff and Eden Robins will be humbly co-hosting.